They Were the Only All-Female, All-Black Team in a NASA Science Competition. Then Came the Hackers. Three teenagers came up with an innovative way to clean lead-contaminated drinking water in public schools . . . an idea so smart it made the finals of NASA's coveted nationwide high-school science competition. Mikayla Sharrieff, India Skinner and Bria Snell, from left, are finalists in a NASA science contest. 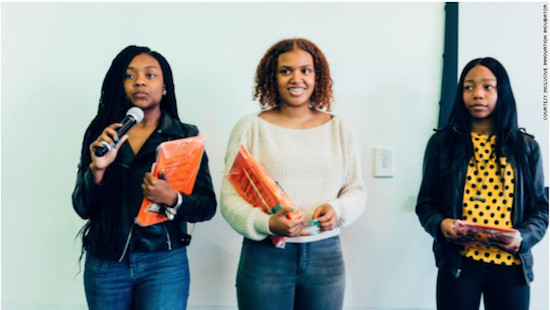 The trio—the only all-female, all-black group in the finals —engineered a filter that purifies drinking water in old public-school buildings by detecting impurities such as chlorine, copper, and bromine. But when NASA opened the contest to online voting, users from 4chan, the image-based online bulletin board, launched a campaign to hack the results, forcing NASA to shut down the voting. 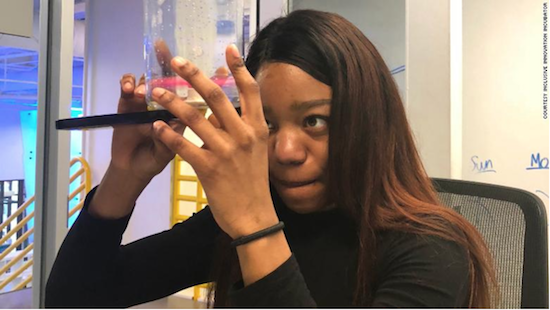 It's a disheartening speed bump in the otherwise inspiring story of Mikayla Sharrieff, India Skinner, and Bria Snell, three 11th graders at Benjamin Banneker Academic High School in Washington, D.C.
"In older structured homes and buildings, lead pipes have been an issue in the media. In D.C., they're currently renovating many public schools," they said in a statement. "As a result, we have a mission to be a part of the community activism and history in the making. Our water filtration system can help aid in that mission." After the nomination, the Banneker students started campaigning on social media to attract support for their project in the public voting stage. "Public voting starts today and we need YOUR vote! We are the only team from the east coast & female minority group!," Sharrieff said in an April 23 tweet. "Hidden figures in the making," Snell tweeted, a reference to the 2016 movie Hidden Figures, the unsung true story of African-American female mathematicians who worked at NASA in the golden era of space exploration. However, some users of 4chan's "politically incorrect" board (abbreviated as /pol/), where hoaxes and conspiracy theories often originate, complained the teens were getting a lot of votes because they were black and spearheaded an effort to torpedo their campaign. A CNN analysis of 4chan/pol/ uncovered several threads urging users to vote for a team of teenage boys instead, using anonymous privacy software to hack the voting system. Some /pol/ users posted racist insults and urged members to spread the campaign to other 4chan boards. NASA said in a statement to CNN it had to "end public voting to protect the integrity of the results" after hackers attempted to change the vote totals. "Unfortunately, it was brought to NASA's attention yesterday that some members of the public used social media, not to encourage students . . . but to attack a particular student team based on their race and encourage others to disrupt the contest and manipulate the vote . . . the attempt to manipulate the vote occurred shortly after those posts," read the statement, issued Monday, April 30. "NASA continues to support outreach and education for all Americans and encourages all of our children to reach for the stars." CNN has been unable to reach the three students for comment. On Twitter, the students have posted NASA's statement on the voting, along with a message thanking people for their support. NASA said it has an accurate record of the voting results before the disruption occurred. A panel of judges this month will choose the winners, who will be invited to NASA's Goddard Space Flight Center in Maryland for two days of workshops with scientists and astronauts. Each winning team will also receive $4,000. The three teens were coached and helped with their project by mentors at the Inclusive Innovation Incubator in Washington, a community space which combines science, technology, and social inclusion. The incubator said in a statement to CNN that the students are seeing "positive outcomes" for the NASA challenge, despite the attempts to corrupt the results. "The ladies are ecstatic about the experience and opportunity the NASA challenge provided," it said. "While it is true they had amazing community support in the popular public voting, the challenge is focused on the delivery of the scientific exploration . . . Win or lose, the girls met their goals and will wish the final winner congratulations."